Every language has words which have been taken from other languages, and the Thai language is no exception. This booklet is the only one of its kind which provides a useful assist for getting a jump start on the Thai language, whether the reader is a beginner or advanced. 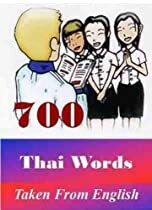 Besides the 700 ‘tap sap’ (Thai word for ‘words and phrases taken from another language’), there are sections for learning Thai words and phrases quickly and easily. Transliterations and Thai spellings are included throughout. Additional illustrations and commentaries are included. With it’s easy-to-comprehend transliterations (spelling foreign words in one’s native alphabet), this is the #1 aid for getting a jump start on speaking and understanding conversational Thai.